Support. This addresses the characteristics of islands as traffic-control devices. Criteria for the design of islands are set forth in At-Grade Intersections with Stop and Yield Control and At-Grade Intersections with Signal Control. Also see MUTCD Section 1A.11 and A Policy on Geometric Design of Highways and Streets. Option. An island may be designated by curbs, pavement edges, pavement markings, channelizing devices or other devices. Guidance. The ends of islands first approached by traffic should be preceded by diverging longitudinal pavement markings on the roadway surface, to guide vehicles into desired paths of travel along the island edge. Support. The neutral area between approach-end markings that can be readily crossed even at considerable speed sometimes contains slightly raised (usually less than 1 in. tall) sections of coarse aggregate or other suitable materials to create rumble sections that provide increased visibility of the marked areas and that produce an audible warning to road users traveling across them. For additional discouragement to driving in the neutral area, bars or buttons projecting 1 to 3 in. above the pavement surface are sometimes placed in the neutral area. These bars or buttons are designed so that any wheel encroachment within the area will be obvious to the vehicle operator, but will result in only minimal effects on control of the vehicle. Such bars or buttons are sometimes preceded by rumble sections or their height is gradually increased as approached by traffic. Guidance. When raised bars or buttons are used in these neutral areas, they should be marked with white or yellow retroreflective materials, as determined by the direction or directions of travel they separate. Standard. Channelizing devices, when used in advance of islands having raised curbs, shall not be placed in such a manner as to constitute an unexpected obstacle. Option. Pavement markings may be used with raised bars to better designate the island area. Standard. Markings, as related to islands, shall consist only of pavement and curb markings, channelizing devices and delineators. Option. Pavement markings as described in EPG 620.2.10 Approach Markings for Obstructions for the approach to an obstruction may be omitted on the approach to a particular island based on engineering judgment. Guidance. Islands outlined by curbs or pavement markings should be marked with retroreflective white or yellow material as determined by the direction or directions of travel they separate (see EPG 620.1.5 Colors). Island curbs with non-mountable curbs at least 6 in. tall shall be marked with retroreflective markings or delineators. 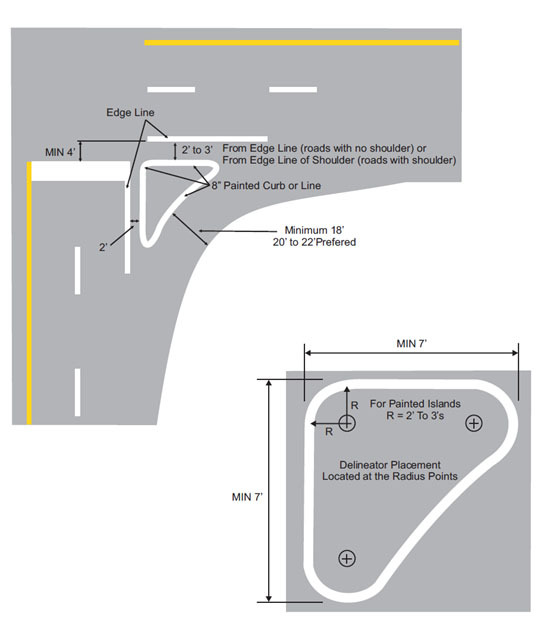 The retroreflective area should be of sufficient length to denote the general alignment of the edge of the island along which vehicles travel, including the approach end, when viewed from the approach to the island. Option. On long islands, curb retroreflection may be discontinued so that it does not extend for the entire length of the curb, especially if the island is illuminated or marked with delineators or edgelines. An island with mountable curbs less than 3 in. tall may be marked with retroreflective markings or delineators. Standard. Delineators installed on islands shall be the same colors as the related edge lines except that, when facing wrong-way traffic, they shall be red (see EPG 620.5.3 Delineator Application). Each roadway through an intersection shall be considered separately in positioning delineators to assure maximum effectiveness. Option. Retroreflective or internally illuminated raised pavement markers of the appropriate color may be placed on the pavement in front of the curb and/or on the top of curbed approach ends of raised medians and curbs of islands, as a supplement to or as a substitute for retroreflective curb markings. Support. Raised islands or medians of sufficient width that are placed in the center area of a street or highway can serve as a place of refuge for pedestrians who are attempting to cross at a midblock or intersection location. Center islands or medians allow pedestrians to find an adequate gap in one direction of traffic at a time, as the pedestrians are able to stop, if necessary, in the center island or median area and wait for an adequate gap in the other direction of traffic before crossing the second half of the street or highway. The minimum widths for accessible refuge islands and for design and placement of detectable warning surfaces are provided in the Americans with Disabilities Act Accessibility Guidelines for Buildings and Facilities (ADAAG) (see MUTCD Section 1A.11). This page was last modified on 7 April 2017, at 13:47.